Not sure if this absence from blogging should be called a sabbatical… but for the purposes of keeping it sounding interesting, let’s call it sabbatical. Life has been incredibly busy, and as I write this I am drinking tea, nibbling on a salad on my brief lunch break in the middle of my new job’s work day. Quickly, minutes have become hours, days have become weeks.. and well, my favorite time of year for food and in general is rapidly coming to a halt. I have oodles of yummy autumn recipes that I have been working on and I am going to have a huge push this week to get them all into your fingertips before it is Thanksgiving. The first time I worked on this recipe was in June, and have finally created a version that I am happy to share with you. At our house we had any amazing growing season this year for cabbage and dark leafy greens so this is very much inspired by my abundance of greens that just simply have to be eaten immediately. Someone recently told me that they love my style of cooking, “healthy comfort food”. I thought oh boy, that is kind of my style of cooking (and eating). Maybe it is that Minnesota girl inside of me with a little bit of “wanna-be” tasteful California hippie girl coming out? Caesar salad may not be the definition of comfort food, but when I think of a comforting classic salad my mind always goes to the Caesar. I’ve had handfuls of traditional Caesar salads, all uniquely delicious but I have not seen a lot of vegan versions. Well in an effort to recreate it, and fulfill a silly food craving I started experimenting. I found that what really helps to create that “caesar salad” like flavor is the vegan worcestershire and capers! When the capers are blended with a high-speed blender they blend in smoothly with they cashews but they visually show darker specs in the dressing hat gives the dressing the same visual appearance. My favorite thing about this specific variation is that it is a slaw! All that means to me is how you cut up the greens and instead of using romaine, I’ve used cabbage. 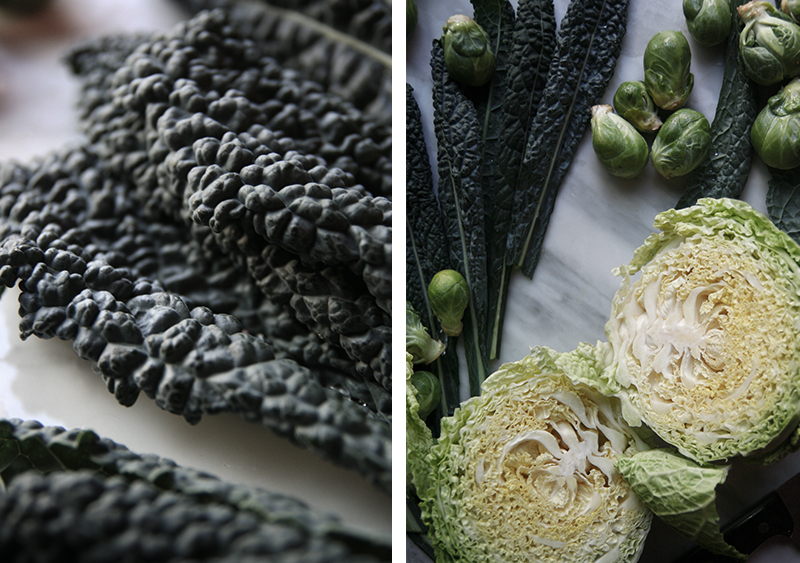 To add a little bit more nutritious love I have included fall favorites, kale and brussel sprouts. 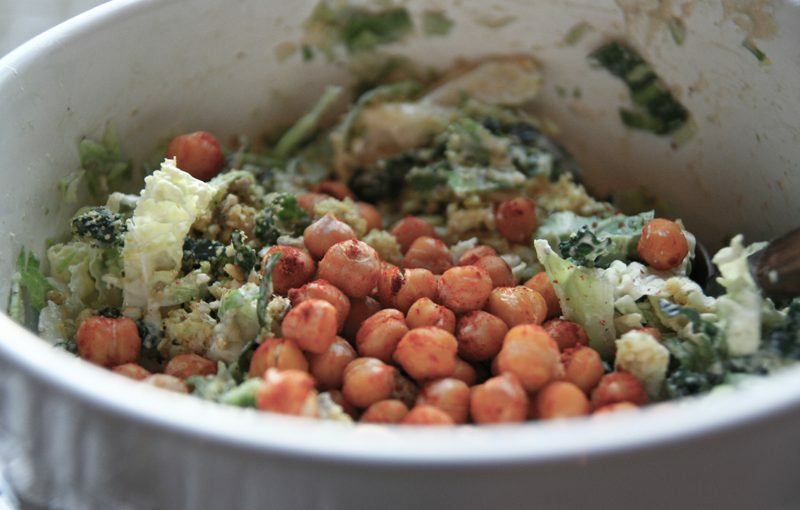 I hate to say it, because there are so many amazing components going on in this salad.. but they real star of the show here are the spiced smoked paprika chickpeas as healthy “croutons”. If you haven’t tried to roast chickpeas yet, you have to go buy a can of chickpeas and do this immediately. They make such a great little snack as well. As I make this salad I always make extra chickpeas and end up munchin’ on them as I chop my greens and make my dressing. They are perfect for in kids lunches or to bring to work and eat as a healthy mid afternoon snack when you need a pick me up. for the roasted smoked paprika chickpeas.. I typically start with prepping my roasted smoked paprika chickpeas. (For selfish reasons, aka snacking as I work) Preheat your oven to 400 degrees. Rinse your chickpeas in a colander and then spread out evenly on a parchment prepped lipped baking pan. Sprinkle with sea salt and smoked paprika, then with a fork roll them around until they are nice and evenly coated with your spices. Bake in the oven for 25-30 minutes. Since our chickpeas will be damp they might need a little bit more time than you think. A nice crispy and dry texture is what we are going for here. Wash, shred and cut all of your greens. 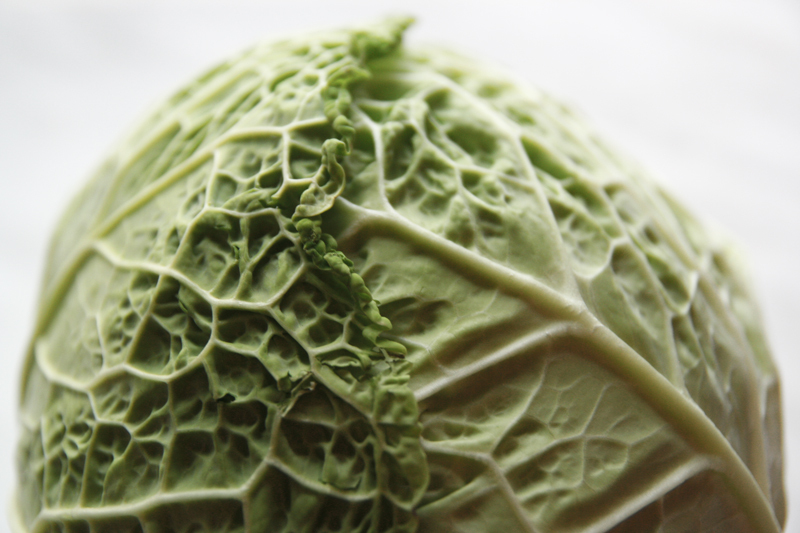 Core cabbage and shred by slicing thinly. 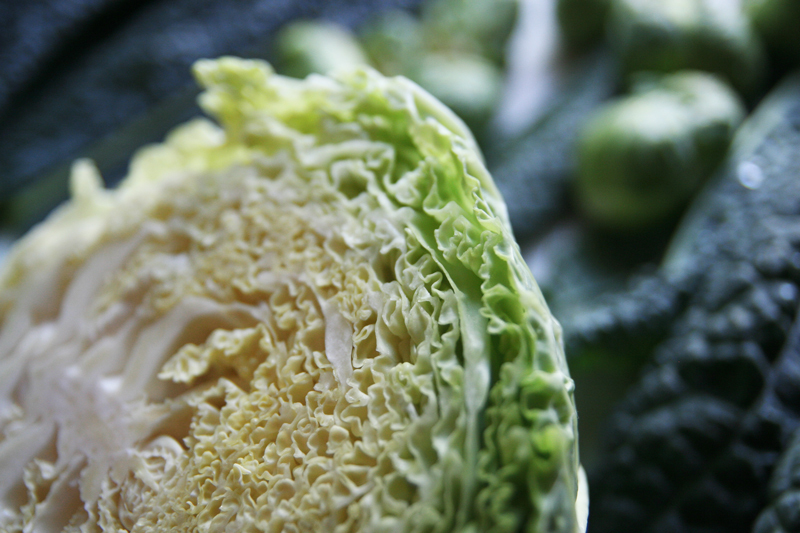 Cut off the tough ends and maybe the core of the brussel sprouts and slice thinly. Remove the stiff vein of your dino kale and slice thinly. 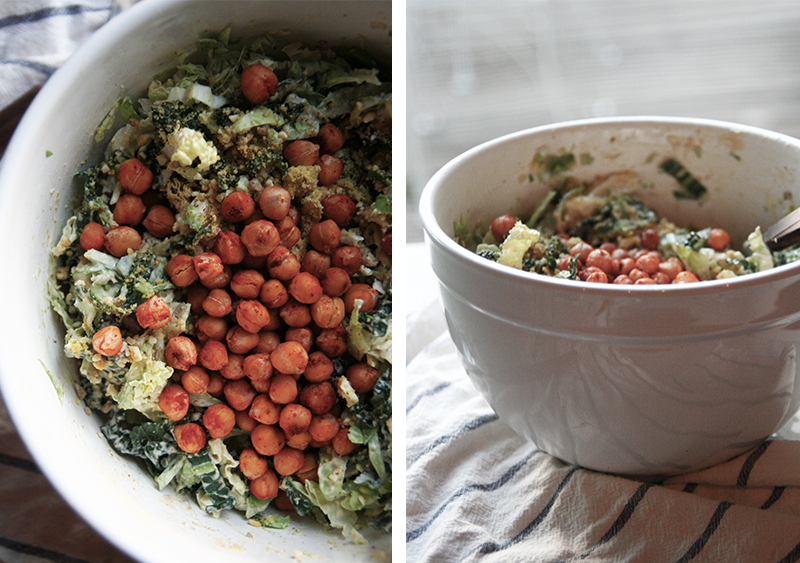 As you go, place your greens in a large bowl. For the dressing, add the caesar dressing ingredients into your high-seed blender or food processor and blend until smooth. Taste dressing and add more salt or more of any ingredient, every time I make it, I make it a little different. Rinse out your blender or food processor, this by no means has to be perfect. Add the ingredients for the hempseed “parm” and pulse until a corse meal. I tend to add a good amount of salt here, more than I have specified, so again, taste test and play with what you prefer. When serving, add the dressing to your greens and toss your greens to evenly coat. Add your hempseed “parm” and toss gently so the hempseed “parm” is not just on the top. 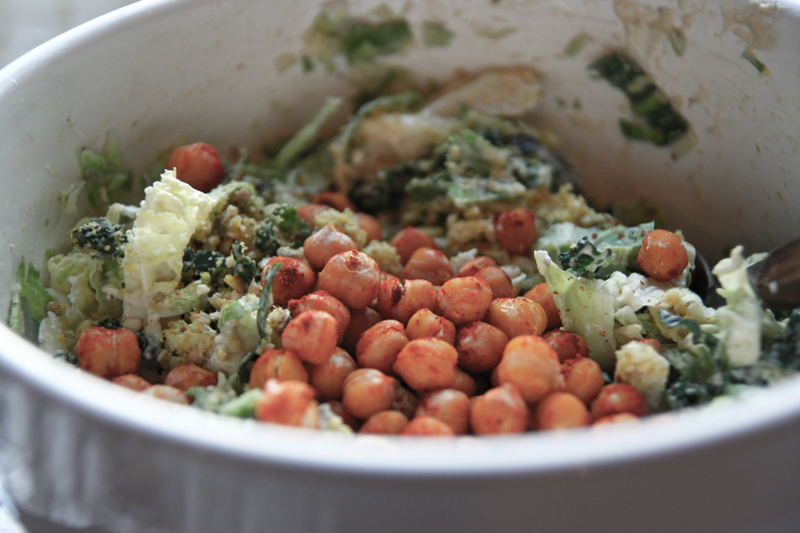 Then top with your roasted smoke paprika chickpeas!